I bet you never thought you’d see this unlikely pair playing together, did you? These two seem like they are good friends, but nature doesn’t make them that way. 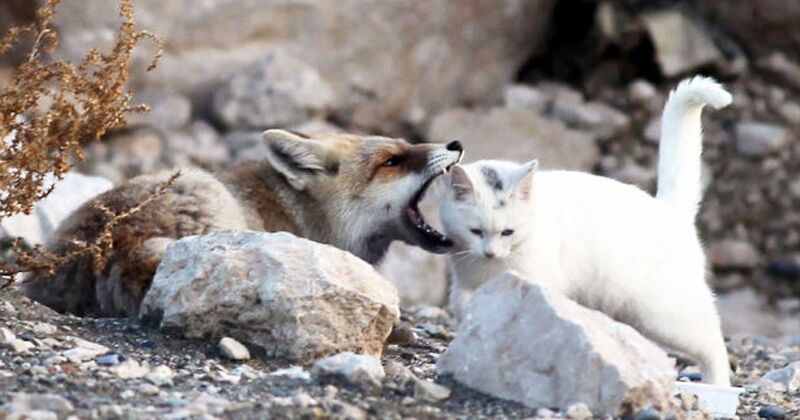 For the most part, foxes and cats ignore each other. They are disinterested in each other’s species, generally, although they have been known to make a meal out of the other one’s kits. That puts a new twist on "guess who’s coming to dinner!" Cats are unpredictable, sometimes taking dogs as companions, in defiance of the ages-old stereotype portraying them as sworn enemies. Foxes tend to keep their distance from both cats and dogs, finding their presence often intimidating. Yet both grey foxes and red foxes will kill and eat a small cat or kitten if resources are scarce and cats have been known to chow down on little foxes, too. Cats are not so easily intimidated by foxes, it seems. If chased by a fox, a cat will often puff herself up to look bigger, arch her back and growl and spit, showing her teeth and claws. When that happens, foxes usually go the other way. Yet there are some fascinating similarities between foxes and cats. Both species are most active at night, and can see in dim light. Foxes have vertically oriented pupils just like cats do, enabling them to get around effortlessly, when you or I would stumble over everything in our paths. The hunting style of both animals is also similar, effectively stalking and pouncing on their prey. Cats and foxes both have sensitive whiskers, which help them navigate in the dark and avoid predators. A common error people make is thinking that the whiskers are like human hair, which is not true. Whiskers are deeply embedded in the body, acting as touch receptors. A blind cat or fox can maneuver just fine by feeling with their whiskers. They also have rough tongues, covered with filiform papillae (backward facing barbs) that help them remove flesh from their prey. Foxes walk on their toes, like cats, creating an elegant silhouette. Many foxes also have retractable claws, enabling them to climb nimbly into trees to sleep—just like cats. So, as cute as it is, this pair of bosom buddies is not your run-of-the-mill duo!